2016 Funko Bethesda Mystery Minis is a retrospective of sorts that honors past video game titles and subjects from the Bethesda Softworks library. The blind-box release keeps things a secret until you crack the seal, making the completion of a full set much more of a challenge. Even if Bethesda is not a familiar name, you likely know several of their titles if you have played video games in the last decade. Notable video game lines include Dishonored, DOOM, Fallout, and The Elder Scrolls. Each option in 2016 Funko Bethesda Mystery Minis touches on these titles and more with miniature figures for major subjects, villains and companions. Because the subject is a mystery, a certain element of chance comes into play with the Best of Bethesda set. Given that cases only include 12 figures and the release totals 15, there are inevitably short prints that fall at much greater odds and even a possibility for exclusives which are only found at certain retail locations. Each of the figures stand around 2 1/2" tall. Full rarity and odds will be added when available. 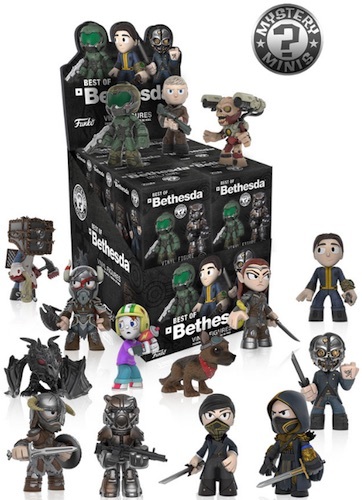 Although several Bethesda games have been featured in the larger Funko Pop! Games line, like Fallout 4, and there is a Mystery Minis set just for Fallout, these are not the first multi-title minis for the popular game maker. An exclusive Mystery Minis 3-Pack was provided at the 2015 E3 gaming conference. The limited set leaves no real mystery and includes a trio of DOOM, Fallout and Dishonored figures in a special edition package.